So each week I like to look through some of the previous MPM links looking for recipe ideas. I can’t of course visit them all but I try to visit as many of them as I can as time permits. I usually randomly jump around from link to link in no particular order at all. When I check the link stats I can see that this random method of link hopping is a popular way of doing it for readers. How do I know? Because the links with the most hits aren’t necessarily the first few that link up on Monday morning. Often the links with the most hits are those with great pictures of food (yum) and/or a great description. For instance, the most popular link last week went to link #7 Saving Dollars & Sense. Her description was Crock Pot Menu Plan and over 300 people checked it out looking to get some crock pot ideas 🙂 There were even many links much much further down the list with over 150 hits each. Links promising lots of recipes/recipe links also tend to be very popular. As for my menu last week it went over pretty well except for Friday when I ordered the pizza instead of making homemade…as you know this happens sometimes. Menu plans are made to be broken occasionally especially in 30 degree (C) weather! Unfortunately that weather only lasted a week but it sure was nice while we had it. Someone left a comment last week asking how I feed my allergic son on nights like these when clearly this particular recipe would be a disaster for his allergies (gluten, dairy, eggs, fish, nuts). Here’s what his allergy safe meal looked like. Plain pork chops and hashbrowns, just the way he likes it. I added his corn after I took the picture. Hash browns are one of our favorites, but I don’t seem to make them much. Might try to do so for breakfast this week. Have a great week! Oh I bet my boys would love those hashbrowns! Thanks for hosting Laura! 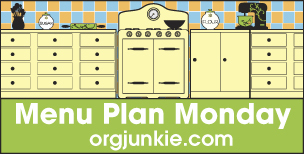 Well, you definitely have a lot of links to jump around to for meal ideas! Enjoy your Monday! Your menu looks great, I really like your Steak Stir Fry, it looks like a great meal. Hope you are having a wonderful week and thanks for hosting! Oh how I would LOVE to have 30 degree weather. My kids all are looking forward to fall and I have to keep telling them that Florida doesn’t have fall weather. I’m also wondering how to adjust my menus as for the past 8 years I’ve been switching to fall recipes about this time of year! Our week of 30 degree weather only lasted for last week and that was the nicest week we had all summer. Unfortunately we are back to it being not so nice and this morning I even had to put on my big winter robe 🙂 Brrr. 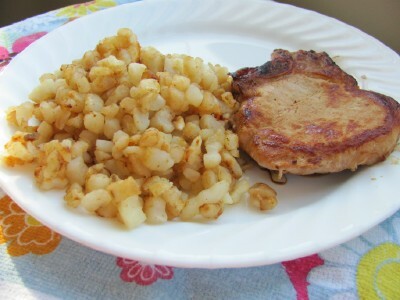 We had pork chop hashbrowns this week, too. Actually we had them yesterday and they were a big hit!! We even have leftovers for tonight. i forgot to put Birthday week in my link discription! Laura, I too can say that I click on every link and find so many recipes! I love it so much! I click through over about 3 days, noting on which one I left off so I can start again easily. Thanks so much for hosting! Mmmm, hashbrowns…I have yet to master those, even the frozen kind! I just bought a new crockpot this weekend so I am definitely going to check out the crockpot menu plan link you posted. This is a busy week for us so I try to get all my meals made ahead of time and in the freezer. Hey, thanks for the shout out. I found that recipe a few months ago and we LOVE it. The chicken always turns out so tender and juicy with the right amount of sweet and sour. Yum! It’s one of our favorites! You’ll have to let me know how you like it. Thanks for hosting the link-up. I love the accountability it’s giving me! I am going to make that baked ziti with spinach next week. Like you, I also have some pesto frozen from my basil plant this summer. I think I’ll make another batch before fall officially begins! I am finally linking up after about a year of stealing ideas, with no accountability! Thanks, Laura! I just posted my link for the first time participating in this. I’m excited to go check out some other people’s menus, to hopefully get more ideas about not only the menu planning, but also just sticking to the menu. Thanks for hosting every week. I know last week you were looking for new food blogs, but I felt like most of my recommendations would be ones you are already familiar with since they participate in MPM. 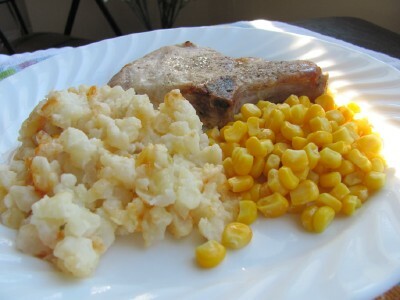 I threw on an extra few pork chops on that Hash-Brown Pork Chop Casserole – there were more than enough potatos to make a few extra portions happen! I’ve been following your blog for a year for all the organizing fun, but this is the first time I’ve ever used a recipie. I’ve been watching the Food Network for the last few months, and guess I was inspired to start cooking a bit more. Thanks! Your menu ideas are always so straightforward and delicious! Thanks for the continuing inspiration. I do the same link hopping and I remember clicking on that link because I was looking for crockpot meals! They’re so efficient on a busy school day. Hi! It’s my first time linking up…I’ve been meal planning for awhile but this is my first time posting a meal plan on my blog. Thanks for hosting the link up! Some great looking meals. As I believe we have some gluten issues in our home as well, it will be interesting to follow what your family has done. Just found your blog and added my meal plan! Very excited to check everyone else’s plans to get some new meal ideas. Wow, Laura!!! I got more than 300 hits on my Busy Mom Recipes web site today and I was really scratching my head wondering why most of them were seeking my oriental salad recipe. I finally noticed the connecting link to your website. Thank you so much for including my recipe. Many people went beyond that recipe looking for other easy family meal ideas. I truly appreciate it and it’s great to find your website to discover more recipes for my family. THANKS!!!! I love that you made the casserole a “lightened” version. It’s so easy to do and still has great flavor. Perfect! Thank you again for sharing with your readers. Your pictures are gorgeous. (And my hubby would’ve been happy if I left the onions out on accident..LOL).